Spring is in full effect! 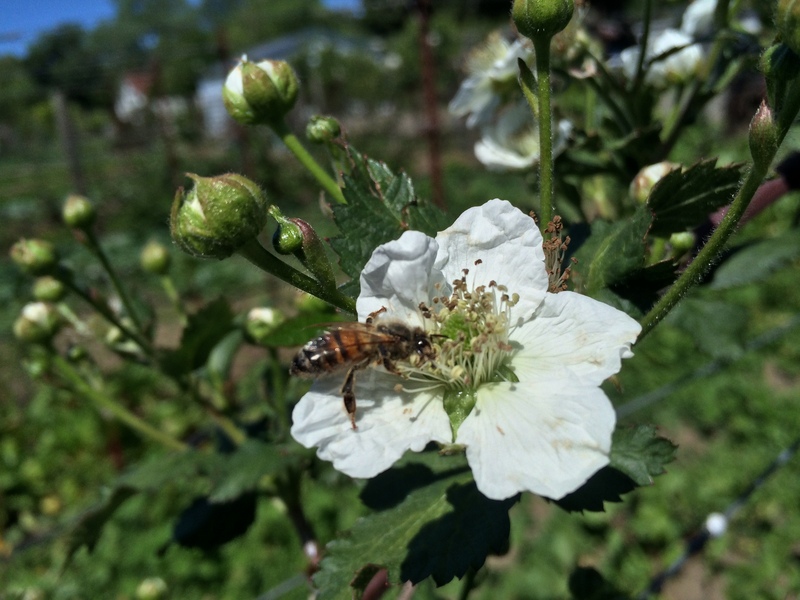 Our busy bees are buzzing about the farm, steadfast in their quest for pollen to make their life sustaining honey! For every bee you see, you can account for 1/12th of a teaspoon of honey in your jar! That’s it! The bees work so hard, and provide so much in such a short time. If our bees go away, so do all of these crops! Not to mention the alfalfa that cows eat! Without bees, farmers wouldn’t be able to provide food for their cows, and then beef would become an insanely expensive delicacy akin to the finest truffle or caviar! So save the bees! Plant bee friendly flowers, like Asters, Sunflowers, Mint, Thyme and Poppies! By providing bees with food, you’re ensuring they have enough energy to pollinate the crops nearest their hive. A colony of bees can also use up to forty four pounds of honey during the winter months to sustain life! Bees are in danger now, because of the wide spread use of pesticides and other bee killing poisons. We love our bees, and never spray anything that can harm them! Today, and for the past few months we’ve been experimenting with this amazing sugar, vinegar and fruit mixture called a shrub! We have raspberry, strawberry and blackberry ready for purchase, and they are so delightful! All the ladies here on the farm are enjoying them quite thoroughly! Jess likes hers mixed with Sprite, and Sheri is enjoying hers over a salad mixed with a bit of olive oil! Since vinegar is such a fantastic super food, aiding in stomach health and digestion we suggest having a little of our shrub everyday! Each six ounce bottle is hand crafted here, and we are selling them for eight dollars! It’s quite the deal!